Young Frank also began his professional career as a shoemaker but became interested in military affairs early on. In 1869, at the age of 17, he joined the reorganized Auburn Light Infantry of the National Guard, State of Maine. While his interest in the Guard increased, he grew tired of shoemaking and took up the printing business, working for the Lewiston Gazette. In 1880 Frank Merrill achieved dual successes. Not only did he begin his own printing business in partnership with Allen P. Moore (Merrill & Moore) but also was elected to the captaincy of his infantry company. 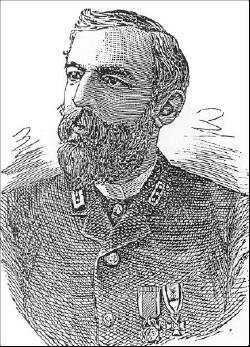 In 1881 he published two military treatises entitled "Guard Mounting" and "The Duties of a Soldier." His colleagues stated that CinC Merrill "worked incessantly, laboring many a day from 6 o’clock at night until 4 o’clock the next morning writing letters, etc., endeavoring to promote the welfare of the Order. The treasury was low in those days and the Commandery was indebted to Brother Merrill several hundred dollars [Note: at that time, his business printed all the supplies needed by the Order], but by careful management he placed the Organization on a solid basis."